Thank God for mySpace! Yes, this is the ideal prologue since through mySpace I was able to trace John Lutzow, the guitarist of one of my favorite Progressive Metal bands – Leviathan from Colorado, USA. John wanted to express his endless artistic expressions and formed BST. In 1994 the band started to become active and endless studio hours helped John to write down material , in order to release their debut in the fall of 1995. It was called “Naming my Pain” and it mostly included instrumental tracks, with a few vocal songs as well. After their debut, BST released 5 albums and some of their songs were put also in Leviathan albums such as “Born Unto” and “Legacy Departing”, that can be traced in Leviathan’s farewell CD “Scoring the Chapters”. 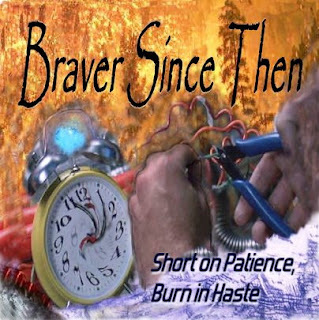 Braver Since Then is a band free from musical borders and it's hard to categorize them. The main ingredient on each and every song is one: intense feeling. There are parts in which the listeners can recognize some Leviathan parts out of the intelligent and prototype riffs that John creates, but also there word “prog” includes each and every influence that an artist can attract. The music is not as heavy as Leviathan’s musical style, as it includes many acoustic guitar parts, but there are riffs and solos that still carry the trademark of the glorious band. One fine example is the riff from the opener “Picture Perfect” or the song “Projecting Feelings”. I surely missed those intelligent riffs that only Leviathan used to present to us and I was quite happy that Braver Since Then and John are active and still present us their vivid talent. Female vocals also accompany at times Derek Blake’s voice, while musical parts are combined with catchy keyboard playing. BST will attract many fans of Prog Rock music, but also many people that are interested in original and “unpredicted” material.